There are few sports more American than baseball, which is why it’s only fitting that the very best baseball gloves should be made in the USA. Finding a reliable glove is like your right hand man on the field, but it’s more difficult to find than you might think. That’s why we put together this in-depth guide and reviewed dozens of products to locate the best baseball gloves made in the USA. Hopefully with this guide you can learn how to review gloves yourself, and find a glove that will serve you well. 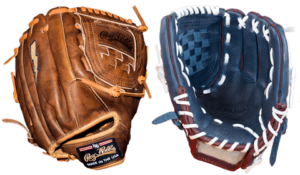 Through extensive research, we landed on 6 of the best baseball gloves made in the USA from 3 different brands. We looked for gloves made from the most durable materials, but also for gloves designed to perform at the highest level. Nokona, Roy Hobbs, and Glovesmith rose to the top as the 3 best brands. Our glove picks are split up into different categories based on field position, so use our recommendations to help you find a glove that will work perfectly for your main position. Below we showcase our top 6 picks and explain what makes each of these glove options stand out as a leader in its section. Read about what we liked, didn’t like, and where to get each one. We were really impressed by the Nokona Walnut Mod-Trap W-1275 for outfielders. This tough glove is a bit stiff and takes work to break in, but it’s tough and sized at 12.75” for comfortable catching far out in the field. 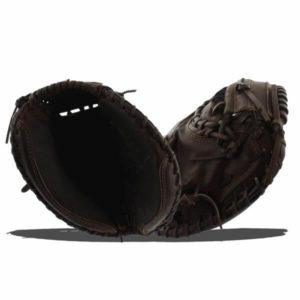 The glove features an effective modified trap design for its webbing and is pretty reliable for fly balls. This lightweight glove comes in at 680g overall, and is made from thin but tough steerhide that’s stained an attractive walnut color. Nokona gloves are known to last through years of heavy use, and are a good option for long-term players looking for durability. 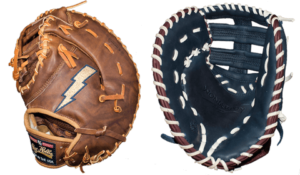 Nokona has a long history of providing excellent quality American-made baseball gloves. 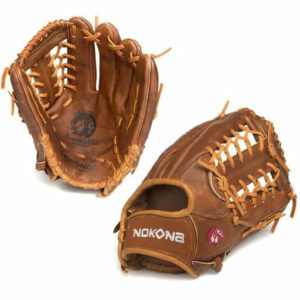 The Nokona X2-1200 continues this tradition, serving as one of the best infielder’s gloves that you can buy today, as long as you can get past its higher price tag. The glove is made from a mix of kangaroo leather and steerhide, for good strength without the weight of some thicker gloves. 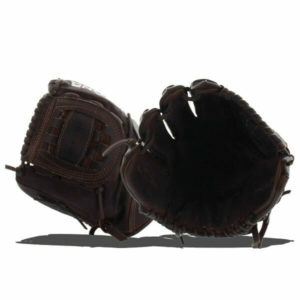 We like the performance of the closed webbing on this glove, allowing for faster transitions from catching to throwing. The 12” size of this glove is good for most infielders, though some will want a slightly smaller glove. Players that want a glove that’s easy to break in will enjoy this product and can begin using it the same day they purchase it. It’s a versatile glove that’s good for most infield positions. Serious baseball players looking for tough gloves often turn to Nokona. With products like the Nokona X2-3300, it’s no wonder customers remain loyal. This catcher’s mitt utilizes a mix of kangaroo leather, steerhide leather, and Nolera padding to create a comfortable, reliable, and tough catcher’s mitt. The glove is built to last through years of use, and it comes with enough padding for stopping even the best fastballs. The glove features an impressive 33” pattern for reliable catches, and a closed pocket for quick handoffs. This pre-oiled glove breaks in quickly, and it comes with a comfortable open-back design for a cooler hand. It comes backed with a 100-day satisfaction guarantee, and most users aren’t likely to return their gloves. Roy Hobbs is a well-known American company that produces solid heavy baseball gloves. That’s exactly what the Pitcher’s Glove is from the company. The glove feels very solid in the hand weighing in at a heavier-than-average 3 lbs. It’s made from thick American steerhide leather and designed with a closed web design. The glove is heavily stitched, thick, and slightly stiff, but it has been hand-rubbed helping to speed up the break-in period slightly. It’s a mid-sized glove at 12”, but some pitchers will want a more compact product. The glove offers good speed thanks to its closed web design though, making it a snappy tool for quickly transitioning into a throw after a catch. Overall, it’s a tough glove, built to last, and designed for versatile performance that pitchers will enjoy. A first baseman looking for a tough glove with quick snappy performance will enjoy the First Baseman’s Glove made by Roy Hobbs. 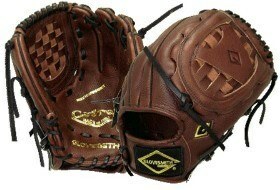 This glove is built to last and comes constructed from tough American steerhide leather. It’s 12.5” in size offering ample catching surface area, but still maintains snappy performance thanks to the Triple-T style webbing within. The glove comes with a double hinged pocket for a more reliable grip, and it’s pre-oiled so you can break it in quickly. This first baseman’s glove is reasonably priced, and comes in both right and left hand designs. The only downside is its weight, at 3 lbs. this mitt is on the heavier side. Players looking for a very specific sort of glove can rely on Glovesmith for an American product that meets their needs exactly. The company is known for crafting gloves with precision in a small shop environment. They make top-quality custom gloves, and are made to order. Each glove features a tough steerhide shell, a full leather lining and a seamless leather palm pad for durability. There are multiple leather options for the interior of the glove letting you customize the comfort of the glove. We love all the different web design options and the wide range of sizes available from a small of 11” to a high of 13”. There’s a huge range of options to select from, allowing you to really personalize the look, feel, and performance of your custom glove. You’ll pay higher prices for these gloves though, and will need to wait several weeks to have it crafted. That’s standard with a custom product though, and a serious player will be happy to wait for a glove made to exact specifications. Durability is a leading factor when considering different gloves. We looked at long-term reviews for different gloves, plus examined the actual material and construction quality when reviewing different gloves. We looked for thick stitching, durable construction practices, and tough leather that will hold up. We preferred products made from rugged steerhide or kangaroo leather for peak performance and long-term durability. We looked closely at grain quality and thickness as well to decide which gloves will withstand heavy use, and which will fail prematurely. The webbing is arguably the most important component of a baseball mitt, and it’s the one area that we looked at most closely while composing our reviews. We don’t choose gloves that all use the same style of webbing, but instead carefully selected web designs that work best for each position. We preferred a more open and deep web design for outfield positions where tough catches are more important than reaction times. We looked for tighter, snappier, and more closed web designs for infield and catcher positions where reaction time is everything. The best baseball gloves aren’t just tough, they’re built for reliable performance. This means they’re carefully hinged for maximum gripping power and quick reactions. We tested each glove out with a long game of catch and by catching fast-paced balls to determine which gloves held up the best. Our top picks are carefully hinged, making it easy to close in around a ball and lock it in place during a catch. Poorly designed gloves were rejected because they won’t offer the same level of performance in competitive games. While playing through long baseball games, it’s important to have a glove that’s comfortable to wear. Our picks are all designed with soft and supple liners that are enjoyable to wear. They’re sized carefully with perfectly portioned finger holes, and often feature added padding in the palm and vents to help keep the hand cool during use. We tested each glove in an extended session in warm weather to verify that it’s sufficiently comfortable for everyday use. The best gloves aren’t cheap, but there’s no point in paying more than necessary either. We ruled out any options priced higher than they were worth based on the material and construction quality of the glove. Our top picks offer a good mix of value and quality that will make you feel like you’re getting an excellent deal for your money.